A point of view novel: Ethereal (Celestra Series Book 1) rewritten through Logan and Gage’s perspective. Angels still roam the earth through Nephilim bloodlines. The battle for power between angelic factions intensifies when a new girl moves to Paragon Island. Logan and Gage Oliver are captivated by Paragon’s newest resident, Skyla Messenger. Logan believes she is the Celestra destined to grow to a ripe old age with him, and Gage believes she’s the girl prophesied to be his. The battle lines are drawn as both Olivers vie for her attention while danger lurks around every corner, and they must work together to keep Skyla safe. Logan fights to keep his new relationship with Skyla, but destiny alters his plans and he must make a decision that might cost him Skyla forever. In Ethereal Knights, we are transported back to Paragon in the retelling of Ethereal, from Logan and Cages dual points of view. Skyla arrives on the island and both boys are infatuated. Skyla and her family have moved into the house of former resident Chloe, who was found dead after a strange disappearance. It soon becomes apparent that Skyla is the girl Cage has been dreaming of for years, the only problem being Logan. He quickly cements himself into her life and Cage can't help but second guess his visions. Skyla is the girl he will marry one day and the relationship between the boys becomes strained. If only Logan would step aside. Logan is besotted, especially now that he can claim Skyla as his girlfriend. They discover that she's a Celestra, a pure higher being. The two share a connection. But their days are numbered. How can two hunted Celestra stay together against all odds? There is only one other person he trusts to protect Skyla. It seems Cages's prayers have finally been answered. The Celestra is ridiculously entertaining. It can't be taken seriously, it's fun, flirty and completely and utterly ridiculous... But I still adore it. The Oliver boys have a cult following and now it seems by popular demand, we have Ethereal Knights, from dual points of view from both Cage and Logan. 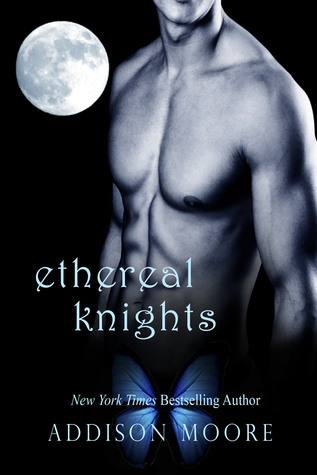 The two boys are polar opposites, Cage is strong and seemingly the alpha male of the two, but in Ethereal Knight, we see his sensitive side. His unrequited love for Skyla and the poems she inspires. Logan shows that he isn't always the sensitive, quiet soul, his inner dialogue is nothing more than a lust filled teenage boy. The point of view from both boys can be a little out of context at times, one minute they will describe the weather on the island as poetic euphemism of making love, the next they are talking about having a painful erection thinking about Skyla. It can be a little awkward. I love the Oliver boys, they really are the guilty pleasure of many women around the world. I would highly recommend this for fans of Celestra, who have read all previous eight books in the series.